- Photo by Mike Blair Cimarron National Grassland is well known to wildlife enthusiasts who travel to Morton County to explore the rolling sandsage prairie. Sand sagebrush is a conspicuous 3-foot-tall shrub with gray-green foliage. Local wildflowers include silky prairie clover, wooly verbena, green milkweed, scarlet gaura, field goosefoot, scarlet globemallow and wild begonia. Pronghorns are found in the area. Elk are also present but only rarely encountered. In woody riparian areas, it's possible to see a porcupine. Bird species normally associated with the arid southwest or the mountains are sometimes found here. Throughout the year Kansas listers search for rarities such as mountain chickadees, scrub jays, Steller's jays, roadrunners, bushtits, curve-billed thrashers, and western tanagers. Mountain plovers are sometimes found in early August. Nesting birds include Cassin's sparrows, lark buntings, scaled quail, and lesser prairie chickens. Prairie chicken booming grounds, or leks, have observation blinds for public use. Blinds may be reserved by tour groups. Limit one group per day. Call the district office to make reservations. Several species of amphibians are commonly found on the grasslands. After rains in spring and summer, drive the roads at night and listen for the calls of plains spadefoot toads, Great Plains toads, Woodhouse's toads, and plains leopard frogs. Common reptiles include ornate box turtles, northern earless lizards, Texas horned lizards, and prairie rattlesnakes. A self-guided auto tour (see below) is a scenic 50-mile drive that highlights many of the interesting wildlife features, including a prairie dog town. Portions of the historic Santa Fe Trail, marked by limestone posts, are visible in many locations. One stop is Point of Rocks, an important landmark on the trail and a great place to find rock wrens. Middle Spring provided trail travelers with a dependable, year-round source of water. The water and trees are an attractive oasis to wildlife of all kinds. Most of the High Plains in Kansas is west of the 100th Meridian. Here the average rainfall west to the Colorado border ranges from 20 to 15 inches. This semiarid condition contributes to the maintenance of the shortgrass prairie biocommunity. Water is the major natural resource for human commerce, as it is the major limiting factor for all life. Over the past four million years, porous sands and gravels, known as the Ogallala aquifer, have descended like a fan from the Rocky Mountains, housing water reservoirs that today sustain the agriculture and industry of western Kansas. An important Southern High Plains stream, the Cimarron River arises in northeast New Mexico and cuts a winding path through the Ogallala of the Oklahoma panhandle, sweeps through southwest Kansas, returns to Oklahoma and enters the Arkansas River at Keystone Lake. The sand dunes along this river are the result of cold air tumbling from retreating Pleistocene glaciers, which produced tremendous winds that swept dry silt (loess) throughout the Great Plains and blew river sands into hills. The pools of the Cimarron River, as well as the springs seeping from its Ogallala banks - have drawn wildlife for thousands of years. And for thousands of years Native Americans, attracted by the bounty, have followed the wildlife trails along its 600 mile course. The earliest hunters of the Cimarron most probably were Folsom, or perhaps even Clovis and Sandia peoples, who lived more than 10,000 years ago. The Cimarron hunting grounds were used continuously by Native Americans into the 1880's, ending with the Kiowa and the Comanches. Point of Rocks and Middle Springs, north of what is today Elkhart in Morton County Kansas, were popular spots on the Cimarron for travelers to scan the plains and replenish water supplies. Coronado stopped here in 1541 on his search for the City of Quivira. In 1821 William Becknell established the Santa Fe Trail, which cut to Middle Springs from the Arkansas River across the hostile, waterless "Cimarron Desert". Many died here, including the mountain man Jedediah Smith, who was killed by Indians in 1831 while searching for water. Homesteaders were slow in coming to this desolate land. The Point of Rocks Ranch, established by the Beaty brothers of Colorado in 1879, was the first permanent enterprise. The ranch ran up to 30,000 cattle and operated until the 1930s. A flood washed away most of the ranch buildings in 1914. Farmers soon found the land suitable not only for pastures, but also for wheat. Wet years and the introduction of the tractor during the 1920's turned the "prairie sea" into golden waves of grain. The plowing, along with the wind and the drought of the 1930's - let loose the loess and turned the cornucopia into a bowl of dust. Morton was the most devastated county of the entire dust bowl era. Congress established acts to buy out the bankrupt farmers, and in 1938 the U.S. Soil Conservation Service started restoration of the prairie. 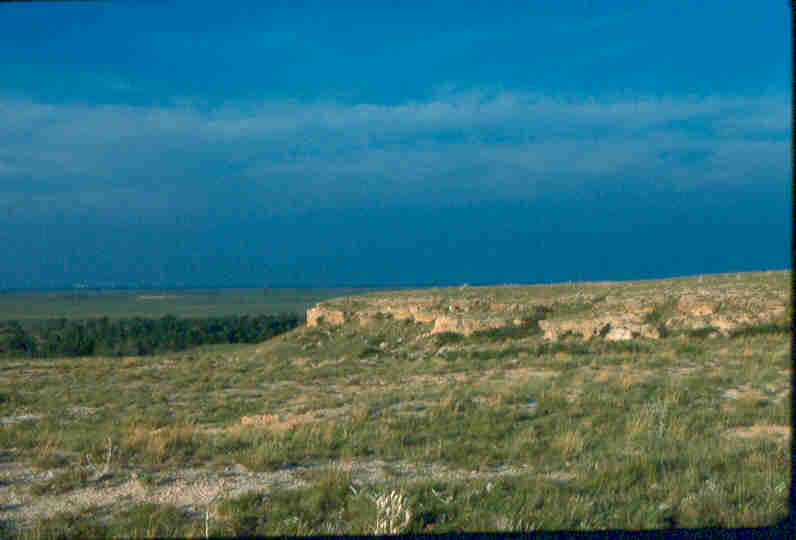 In 1954 management was turned over to the U.S. Forest Service, and in 1960, 108,175 acres of shortgrass prairie and sandsage prairie, north and south of the Cimarron river became the Cimarron National Grasslands; dedicated to water conservation, wildlife management, recreation, cattle grazing, and mineral production. Today, as ranchers and tourists peer from the top of Point of Rocks they are inspired by the awesome beauty of the plains and canyons, and haunted by the ghosts of the past. Middle Springs is now an Outdoor Wildlife Learning Site (OWLS) with nature trails and interpretive signs used by area school children and tourists. Water available, Restrooms, Fishing Pond. 14 campsites - no hookups. Primitive camping allowed in most of the area. Off-road driving is prohibited. Click the icon to find a birding list for Morton County. Cimarron National Grasslands is in the SW corner of Kansas. Click here for a Google Map of the site. Directions: The District Office, identified as the Cimarron National Grasslands Range Station, is on U.S. 56 in Elkhart. Stop here (hours: M-F, 8-5) to pick up a map, wildlife checklist, and the self-guided auto tour booklet; or write for the material: (see contact info below) The self-guided auto tour begins 2 miles north of Elkhart on K-27. There is a picnic area south of the river 7.5 miles north of Elkhart on K-27. South of the picnic area is a road east to a campground. Middle Spring and Point of Rocks are reached from K-27 by turning west, 0.5 miles north of the Cimarron River bridge. Contact them at (620) 697-4621 if you have specific questions about use or management of the site. Visit their web site by clicking here.